See Walker (1996, §§7.5, 8.4.2) . The Weierstrass functions take real values on the real axis iff the lattice is fixed under complex conjugation: 𝕃=𝕃¯; equivalently, when g2⁡,g3⁡∈ℝ. This happens in the cases treated in the following four subsections. See Walker (1996, §8.4.2) . This occurs when both ω1 and ω3/i are real and positive. 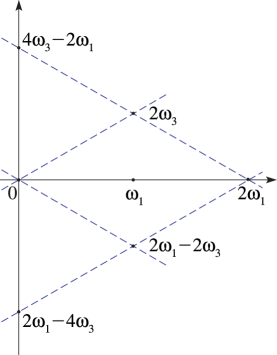 Then Δ>0 and the parallelogram with vertices at 0, 2⁢ω1, 2⁢ω1+2⁢ω3, 2⁢ω3 is a rectangle. Also, e2⁡ and g3⁡ have opposite signs unless ω3=i⁢ω1, in which event both are zero. As functions of ℑ⁡ω3, e1⁡ and e2⁡ are decreasing and e3⁡ is increasing. See Walker (1996, §7.5) . Some errors are corrected here. This occurs when ω1 is real and positive, ℑ⁡ω3>0, ℜ⁡ω3=12⁢ω1, and Δ<0. The parallelogram 0, 2⁢ω1-2⁢ω3, 2⁢ω1, 2⁢ω3, is a rhombus: see Figure 23.5.1. The lattice root e1⁡ is real, and e3⁡=e2¯, with ℑ⁡e2⁡>0. 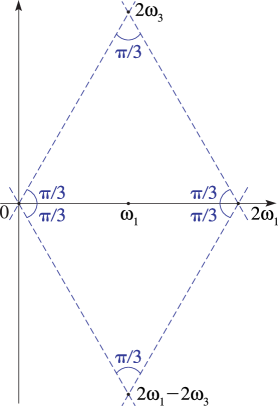 e1⁡ and g3⁡ have the same sign unless 2⁢ω3=(1+i)⁢ω1 when both are zero: the pseudo-lemniscatic case. As a function of ℑ⁡e3⁡ the root e1⁡ is increasing. For the case ω3=eπ⁢i/3⁢ω1 see §23.5(v). See Walker (1996, §7.5) . This occurs when ω1 is real and positive and ω3=eπ⁢i/3⁢ω1. The rhombus 0, 2⁢ω1-2⁢ω3, 2⁢ω1, 2⁢ω3 can be regarded as the union of two equilateral triangles: see Figure 23.5.2.